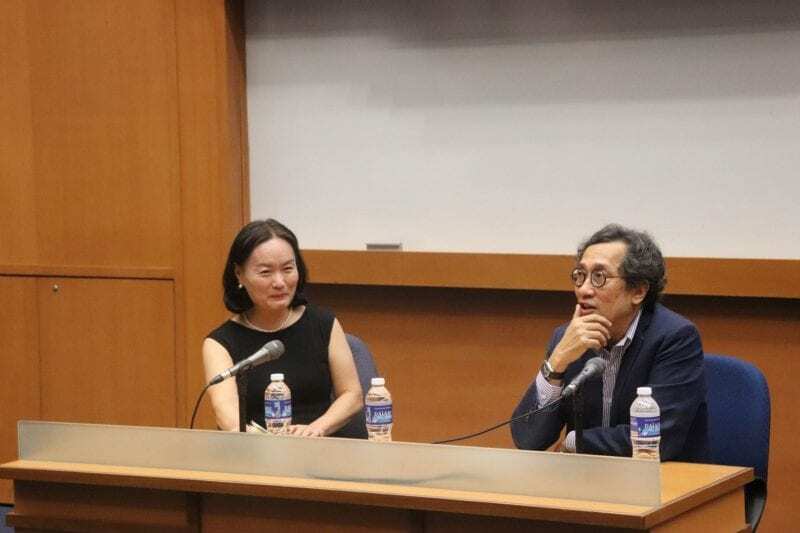 On 20 February 2019, Mr Bilahari Kausikan (Arts and Social Sciences ’76) presented the complex and sometimes tense bilateral relations Singapore has with Malaysia and Indonesia, while concisely describing the importance of understanding Singapore’s rather different relationship with each. Kausikan was candid when describing Singapore’s sovereignty, “The governments of our neighbours deal with Singapore as a sovereign nation because we have developed capabilities,” he said. 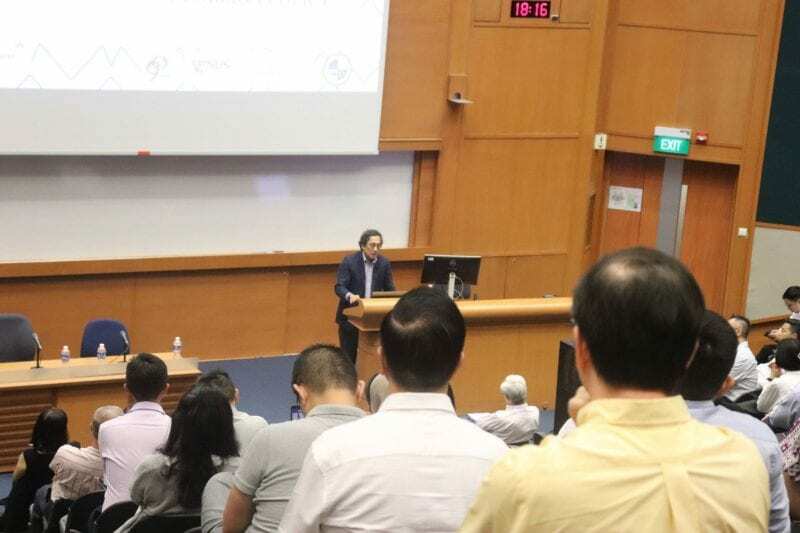 Given recent public discussions over the deferment of the Singapore-KL high-speed rail, the Instrument Landing System (ILS) over Seletar Airport and the extension of Malaysia’s port limits into Singapore waters, it was no surprise that Singapore’s bilateral relations with Malaysia took centre stage during his lecture. Mr Kausikan cautioned against assuming recent differing opinions were solely due to the surprise election of the Pakatan Harapan (PH) government in Malaysia and the return of Dr Mahathir Mohamad as Prime Minister of Malaysia. Mr Kausikan was optimistic the next generation of Singapore’s leadership is capable. In particular, he singled out Minister of Finance Heng Swee Keat, former Principal Personal Secretary to the late Mr Lee Kuan Yew and Minister of Trade and Industry Chan Chun Sing’s tenure as Chief of the Army. Their vast experiences can inform Singapore’s future foreign policies. Mr Kausikan speaking to the audience about Singapore and Malaysia-Indonesia relations. Mr. Kausikan responding to questions with Deputy Head of Department of Political Science Assoc Prof Terence Lee. Mr Kausikan emphasized that while Singapore’s relations with Malaysia and Indonesia are similar, there are some differences. Since 2014, Singapore has been Indonesia’s largest foreign investor with US$8.4 billion in realised investments in 2017 alone. Cordial bilateral relations advance Indonesia’s domestic goals while allowing Singapore access to the largest economy in ASEAN. Both are among each other’s top trading partners and source of visitor arrivals. He emphasized putting aside differences and cooperating whenever possible throughout the discussion. When asked about the threat of cross-border terrorism by a member of the audience, he replied the security departments of the three countries collaborated closely to ensure safety. This was a good example of Singapore, Malaysia and Indonesia working together towards a common goal. “The Malaysian Special Branch, the equivalent of our ISD, is extremely professional and cooperates closely with our security authorities” he said. Later, he recounted a 2016 incident when Indonesian authorities arrested a group of militants planning to launch rockets towards Singapore from Batam, as an example of Indonesia-Singapore addressing cross-border terrorism. Mr Kausikan stressed that Singapore “can cooperate with our neighbours, should cooperate, and in fact must cooperate” while safeguarding and advancing national interests. Bilahari Kausikan is Chairman of the Middle East Institute, NUS. From 2001 to 2013, he was first the second Permanent Secretary and then Permanent Secretary of the Ministry of Foreign Affairs (MFA). He was subsequently Ambassador-at-Large until May 2018, having previously served in various MFA appointments, including as the Deputy Secretary for Southeast Asia, the Permanent Representative to the United Nations in New York and as Ambassador to the Russian Federation. This five part lecture series is organised by the NUS Political Science Society with support from the Faculty of Arts and Social Sciences (FASS) and the Department of Political Science. Established in 1929, FASS, one of the earliest and largest faculties is celebrating its 90th anniversary this year. Whilst witnessing numerous changes, we remain steadfast to our vision to strive forward as a premier faculty of excellence in humanities and social sciences that nurtures tomorrow’s engaged, thoughtful and creative global citizens. To mark this occasion, the Faculty is organising a series of events showcasing the strength and breadth of the Faculty’s research as well as kick start future initiatives that would benefit the generations of students who will come through our halls. On 30 Jan 2019, Bilahari Kausikan (Arts & Social Sciences ’76) spoke on the practice of foreign policy at NUS. He situated the fundamental role of national interests in foreign policy and explained why Singapore’s national interests are not better and more widely understood. He examined common errors in thinking about foreign policy, as well as the creation and maintenance of relevance for a small city-state like Singapore. The inaugural lecture was presided by NUS President Professor Tan Eng Chye, Senior Deputy President and Provost Ho Teck Hua and FASS Dean Professor Robbie Goh. Mr. Kausikan sharing foreign policy insights with the audience. Mr. Kausikan responding to questions with Head of Department of Political Science Assoc Prof Soo Yeon Kim. 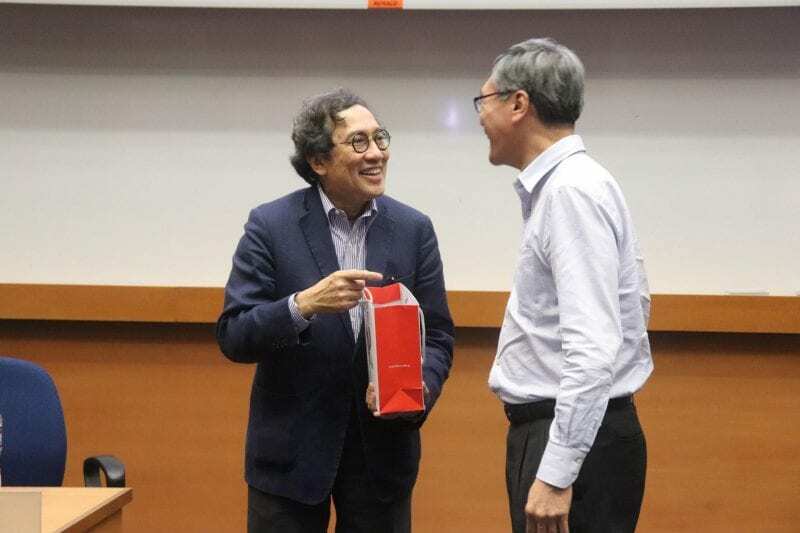 NUS President Prof Tan Eng Chye presenting a token of appreciation to Mr. Kausikan. In conjunction with the Faculty of Arts and Social Science’s 90th anniversary, the Department of Political Science is hosting Kausikan’s lectures on the Practice of Foreign Affairs. Full information, topics and dates available here. Established in 1929, the NUS Faculty of Arts and Social Sciences (FASS), one of the earliest and largest faculties is celebrating its 90th anniversary this year. Whilst witnessing numerous changes, we remain steadfast to our vision to strive forward as a premier faculty of excellence in humanities and social sciences that nurtures tomorrow’s engaged, thoughtful and creative global citizens. To mark this occasion, the Faculty is organising a series of events showcasing the strength and breadth of the Faculty’s research as well as kick start future initiatives that would benefit the generations of students who will come through our halls. 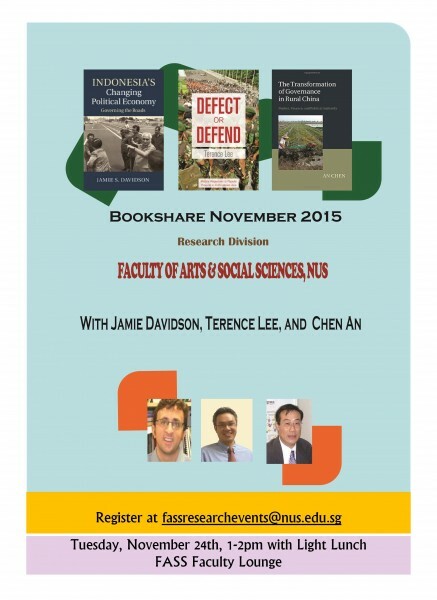 This edition of FASS Bookshare features three single-authored books focusing on Asia by political scientists at NUS. The Bookshare Catalogue is available here. If you would like to attend Bookshare, RSVP with your full name and email, along with the subject line “Bookshare” to fassresearchevents @ nus . edu . sg. More information about each book and author can be found here. Another eventful year has come to pass. Another batch of graduating students marked the end of their formal school years and the beginning of an exciting future ahead with the annual Commencement Ceremony at the University Cultural Centre. On top of that, respective departments also held Commencement Celebrations for their graduates to bid them farewell, as well as to welcome them into the FASS Alumni family. Other than the usual get-togethers, some departments added in a dash of intellectually engaging components. The Department of History had a quiz on history and, as with tradition, held their famous customary event – Mad Hatters! – inviting alumni from the Classes of 2013, 2007, and 2008. Some hats on display included a Samsui woman’s, a Bollywood Cop’s, a Shameless Monarch’s, and even a Bird’s Nest hat. The English Language department also had a pub quiz of sorts which tested the graduates’ linguistic and general knowledge about NUS. They also had a graduate who recited a poem he had specially penned for the occasion. Graduates too did not miss out on the opportunity to showcase their musical talents. The Department of Japanese Studies invited alumni from previous years and many friendly exchanges were made between the graduating class, faculty, and alumni, while sharing a communal Japanese meal at Waraku Restaurant. A happy coincidence occurred during Social Work Department’s graduation event – two PhD graduates found that they were classmates from the same Honours batch 18 years ago. All in all it was a joyous occasion for all parties involved. Click on the following links to read more about the individual events that were held, as shared by the respective departments! We wish the Class of 2014 the best in their endeavours! Disclaimer: Links are correct and available at the time of posting. This year, a good number of the departments in FASS, together with some of their alumni associations, organised events to celebrate their graduates’ commencement. Lunches, dinners, and even themed parties were held. 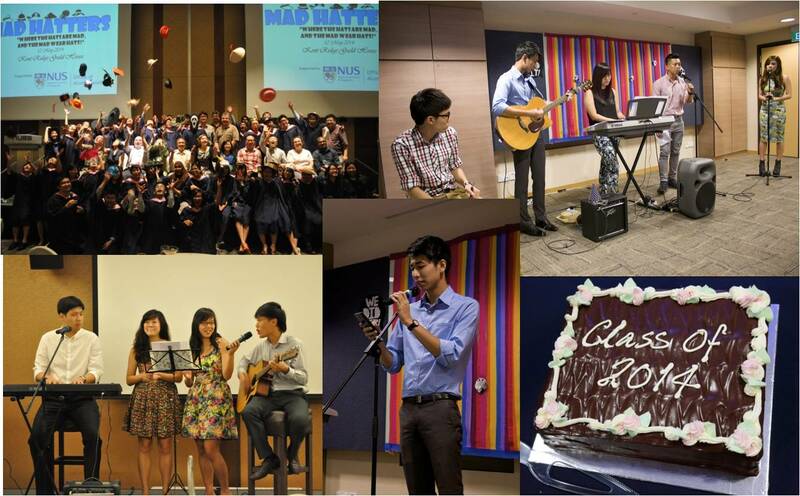 Some of the highlights include: personalised congratulatory letters with calligraphy (Department of Chinese Studies), performances put up by the NUS Rondalla and the Chorda Trio (Department of Economics), instant photo booth with fanciful props (Department of Political Science), and students and staff coming with ‘mad hats’ of their own (Department of History). 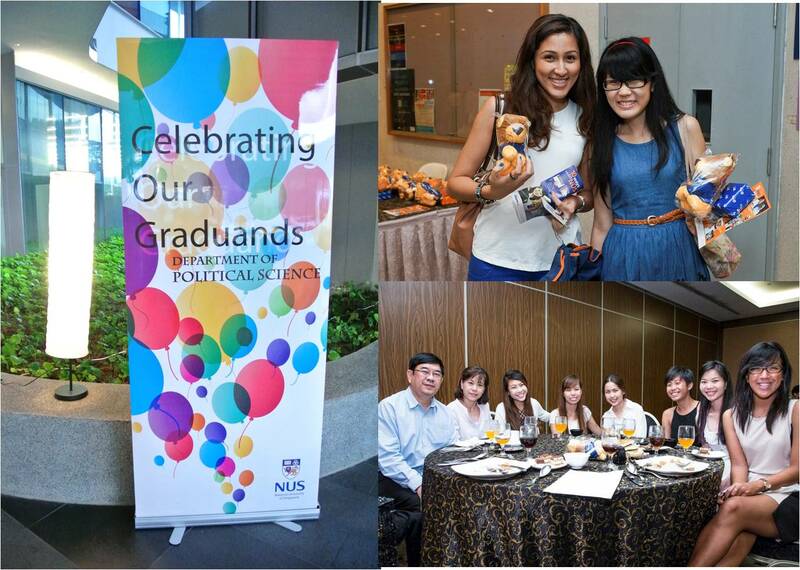 We would also like to take this opportunity to wish all graduates the best in their future endeavours! Last month, two students from FASS were awarded the Mid-Term Defence Merit Scholarship from the Ministry of Defence (MINDEF). Both Political Science honours students, Tan Keng Meng and Chen Zixian Zach received the prestigious award from Minister for Defence Dr Ng Eng Hen at an awards ceremony held at the Sheraton Towers. 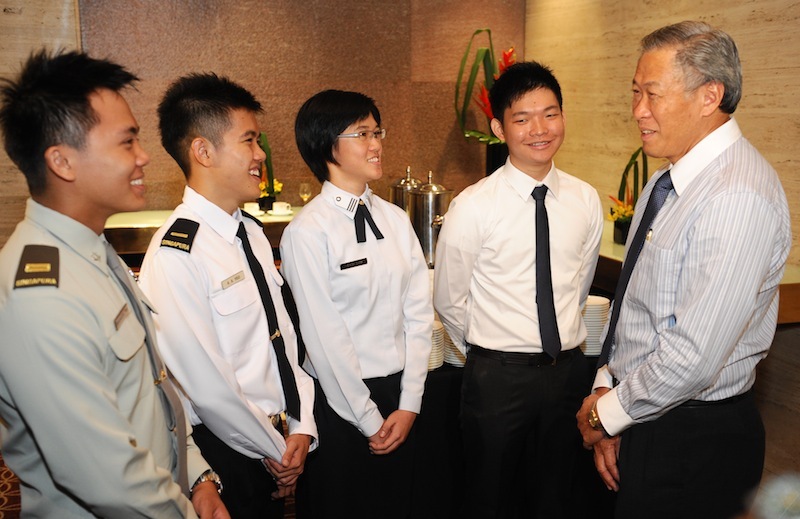 The Defence Merit Scholarship was introduced with the aim to recruit outstanding undergraduates and groom them for senior management positions in MINDEF. With the wide spectrum of career opportunities available in MINDEF, the scholars can look forward to rewarding and challenging careers that will develop their potential to the fullest. 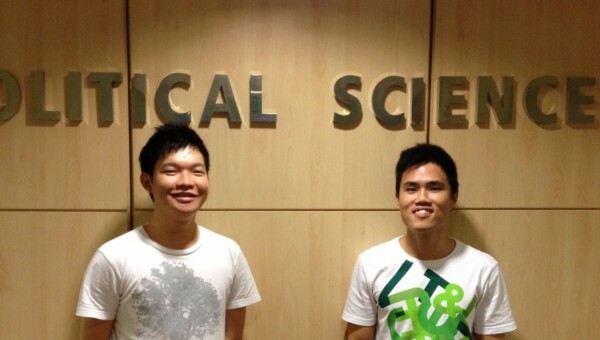 FASS News caught up with Keng Meng and Zach to find out more about their motivations for getting the scholarship and how they feel about joining the public service after completing their studies. Congratulations on winning the Defence Merit Scholarship. Can you share with us what inspired you to take up this scholarship? Keng Meng: A confluence of events inspired me to take up the Defence Merit Scholarship. First, I have always been interested in defence issues and I feel that every Singaporean has a role to play in protecting Singapore. Second, as a Political Science major, I am fascinated by international affairs and foreign relations. Third, my overseas exchange and internship experiences have been instrumental in affirming my passion for public service. These three factors converge upon a career with the Ministry of Defence. This scholarship is an opportunity for me to serve, pursue my interests, and apply what I have learnt to the benefit of Singapore and the world. Zach: Having done an internship at MINDEF (coordinated by the NUS Career Centre), I felt a strong alignment between my personal values and the core values of the organisation. It gave me the confidence that MINDEF would offer me excellent opportunities in a dynamic work environment and at the same time fulfill my personal mission. I consider myself fortunate that MINDEF also offers me the chance to pursue my research interest in military involvements – something that I like and am good at – as a full-time job. The scholarship was essentially icing on the cake, as it allowed me to commit myself to the organisation and vice versa. As such, taking up the scholarship was an obvious choice. And how has your NUS education influenced your decision to join the public service? Keng Meng: It was at NUS that I nurtured my passion for and learnt extensively about politics, specifically international relations. This was complemented by the breadth component of the NUS education that saw me taking modules outside of my major. These modules included Communications and New Media modules which I took extensively. They enabled me to connect politics with other disciplines and the wider world. Consequently, the comprehensive NUS education helped me better understand the world I am living in. This encouraged me to do my part and make a difference to the world. In addition, it also impressed upon me the gravity of my decision to join the public service. For this, I would like to express my gratitude to NUS, in particular the Departments of Political Science and Communications and New Media, for all the knowledge I have acquired. I look forward to continue amassing a wealth of knowledge in the future. I found an intellectually stimulating environment at NUS. I had really great and rewarding discussions with the Political Science faculty and my fellow Political Science majors on a variety of topics such as Singapore politics and the global economy. Our passion for what we study rubbed off on one another. This created an environment that supports our pursuit of knowledge and dreams. To this, I want to say thank you to the Political Science faculty, staff, and majors, especially my fellow Honours students, for all the help they have given me. Zach: Having taken numerous FASS modules (particularly those from the Political Science Department), I have come to believe in the vital role that the public service plays in shaping the Singapore society. Whereas the private sector concerns itself with cost and benefit, profit-oriented approaches, the public sector focuses itself on maximising the public interest. As such, this idea of working for the people appeals strongly to me. Furthermore, I feel that the various disciplines within FASS have done an excellent job in equipping its students with critical skills, with which to examine every aspect of life. Such skills have only served to benefit me in seeing many issues in contemporary societies that could be handled better or should be tackled. Hence, these two aspects of my education made it a natural choice to aspire for a career within the public service, to get involved in charting Singapore’s future path amidst a challenging local and global environment. Where do you see yourself ten years on? Keng Meng: I am committed to a career with MINDEF and want to continue working in the public service. Over the next few years, I hope to develop skills and accumulate experiences that would enable me to better contribute to Singapore and the world. I also hope to be in a position in which I could make useful contributions to NUS such as participating in the FASS Mentorship Programme. Zach: I wish to see myself as a leader within the public service, wherever I feel that I can contribute, while continuing as an avid learner. I hope to be in a position to bring about positive change, be it in my local community, within MINDEF, the Public Service or in the greater society. That being said, I certainly wouldn’t mind going back to school again, because I’ll definitely be missing having academic debates in tutorials and seminars! This is kind of unrelated, but we noticed that you guys went on the Student Exchange Programme (SEP) at University of California, Berkeley and Boston University. Can you share something about your SEP experience with us? Keng Meng: An overseas student exchange programme is an opportunity to share and take in perspectives, especially from those of different cultures. The thing that struck me the most was the high level of student involvement at UC Berkeley. The students are extremely active in the university, community, and nation at large. They want to make their voices heard and do their part in shaping their community. For instance, during football matches with other universities, the stadium overflowed with students that came to support their school. A town hall meeting with the school administration on rising tuition fees saw an overwhelming number of students participating in the dialogue. There is a strong culture of identification with the school and community. This is what inspired me to play an even more active role in contributing to the society. 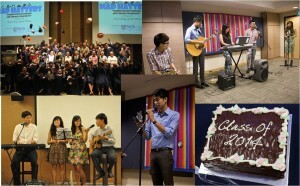 There are passionate students in NUS too, as demonstrated by NUS Student Union (NUSSU) and the NUS Arts Club. As a member of the Arts Club, I have met friends who have sacrificed their time and energy to organise projects for the faculty and NUS. My time at Berkeley was memorable in part because of the atmosphere of energy created by the students. On this note, I feel that participating in the Arts Club (or any other faculty clubs, CCAs, and NUSSU for that matter) is a great opportunity to be involved in NUS and the community. Zach: One takeaway for me was the need to be accommodating of diversity, in particular the diversity of thought and cultures. Specifically, my trip to Boston has taught me the importance of accepting other cultures and peoples, especially since Boston is an extremely diverse society. There is always something you can learn from anyone, no matter who you find yourself amongst. In Boston, I encountered people of various ethnicities and from all walks of life, and through these interactions I’ve since come to gain new perspectives that have considerably shaped my understanding of the world. Thank you, Keng Meng and Zach. We wish you fulfilling and successful careers ahead! Come Celebrate the Department of Political Science’s 50th Anniversary! The Department of Political Science at the NUS, was formally established in 1961 (before Singapore emerged as an independent nation-state). It is thus, now reaching its 50th year! In many ways, the evolution and growth of Political Science mirrors that of NUS and modern Singapore itself – having been faced with numerous challenges over the decades, we have now emerged as a Department, which is internationally recognised as among the best in Asia. Obviously, the Department’s current achievement is not possible without the contributions and sacrifices of its professors, the farsightedness of NUS’ leadership, the quality of the courses/modules offered, and of course, the equally high quality of its graduates whose performance in both the public and private sectors have generally given the Department a good name. It is thus time for all of us, as staff, students, alumni and friends of Political Science, to celebrate this half a century Golden Jubilee! 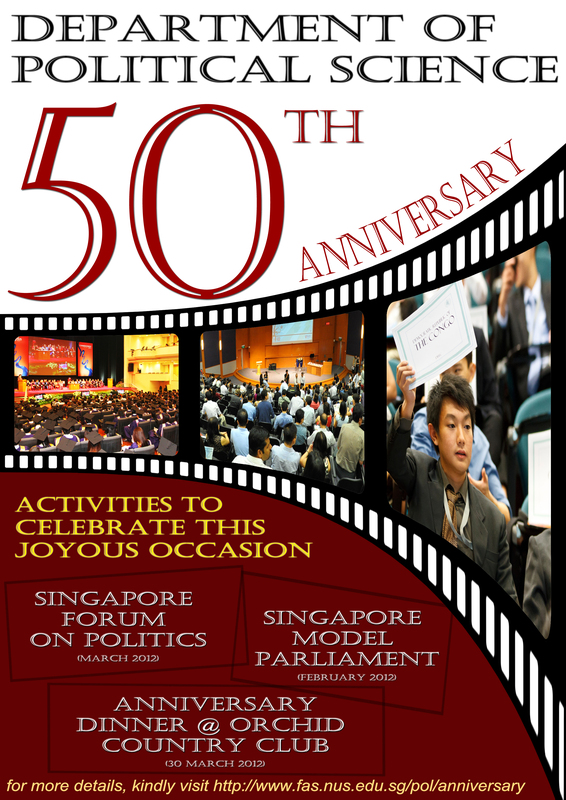 We have lined up three major activities to be held within this 2011-12 Academic Year: (1) 50th Anniversary Dinner (2) Singapore Forum on Politics (3) Singapore Model Parliament. Brief highlights of each of these activities are given below. For more details, please go to www.fas.nus.edu.sg./pol/anniversary#dinner.